There’s nothing more pleasant and more awesome to the eyes as seeing your device getting the most customization, looking elegant and makes you a proud owner of such awesome device. Using varieties of fonts on your android phone can be one of the best way to fully take control of your devices making it to stand out among others. Ever wondered if its actually possible to use your handwriting as a default font on your device thereby getting rid of the awful fonts you don’t desire. This comes in handy especially if your handwriting is something that entices people, now with the ability of using your own handwriting on your android phone, there’s a huge possibility that people will appreciate your phone as a well customize unique device. In this article we are going to guide you on how you can easily use your handwriting as a font on your phone. Fonts can help to differentiate your device from others and as said earlier it can make it look unique and awesome. We are going to use an online tool by name MyScriptFont to achieve our aim here. MyScriptFont.com enables you to use your own handwriting like every other font installed on your computer. With MyScriptFont.com you can give your digital produced documents a personal touch again. Let’s begin!.. Go to MyScriptFont website and download the available provided template, you can download the PDF or PNG format as provided. After downloading print it but if your device supports a pen touch, then you do fill it directly or use a paint program. 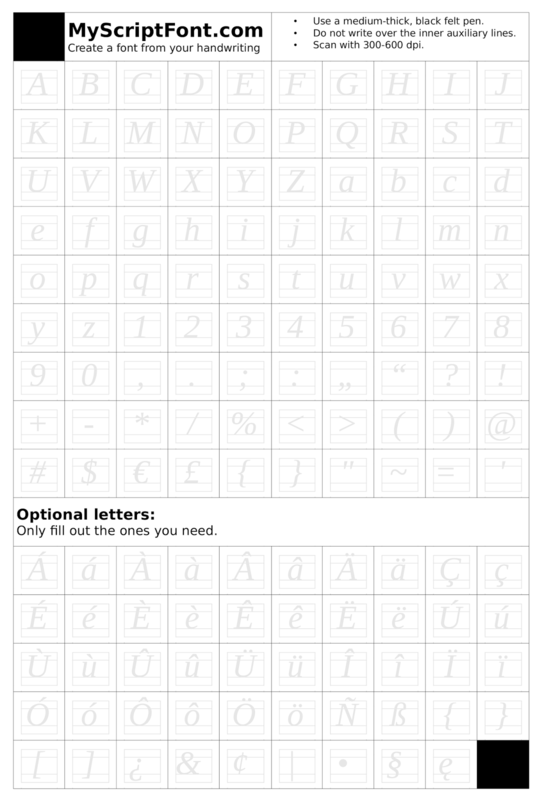 Now carefully fill in the template, it is recommended you use a fine tipped black marker to fill it in other to get a good visibility of your handwriting. Also try to use your best handwriting and make sure you don’t leave the box during the process or else your font won’t appear nice when it arrive in your phone so do it tactically and carefully. Once you’re done filling the template, scan it at a very decent resolution. We recommend 300-600 dpi. You can also use your smartphone to scan it with the aid of tiny scanner. After filling it, save it and go back to the MyScriptFont website and upload the scanned template. Give it a lovely name and hit the start icon. Wait till the process finish and you will be presented with an example of your handwriting. Download the generated.tff file and save on your phone. How to change the default font of your phone to your generated handwriting. Download the ifont app for your android phone, endeavor to do a backup of your recent font by navigating to the ifont module>factory font>backup font. Now navigate to My>Myfont. On the next page tap the red “Click this” area and Navigate to your .ttf file path you saved earlier, select it and once it loads, click set. Then reboot your device. If it doesn’t look exactly like your handwriting, re-print the template at a smaller size or goto settings>display>font size. Increase or decrease your font. You can also try this steps on a non-rooted device, follow all the above steps but its recommended you use Hifont instead of ifont. Done! Enjoy your handwriting as a font on your phone. Endeavor to drop a comment below regarding how you feel about this tutorial.